About 32,000 years ago, Lake Bonneville formed, covering most of northwestern Utah (the Great Salt Lake is a remnant). About 15,000 years ago, it broke out of its natural dam near present-day Pocatello Idaho, creating the Bonneville Flood - possibly the second largest ever on the planet, the largest possibly being in Siberia 14,000 years ago. For 8 weeks it flooded out at maximum, carving canyons and falls, ripping out boulders from canyon walls, depositing them along the river. 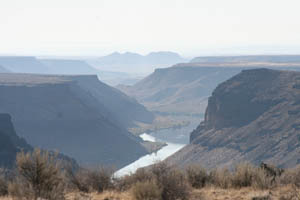 By 12,000 years ago, humans were living on the Snake River Plain. (The earliest evidence from a cave near Dietrich, Idaho, are tool flakes and a basalt knife 14,500 years old.) 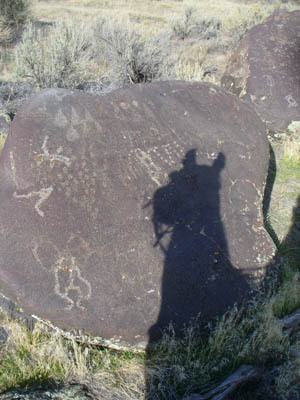 Petroglyphs carved on many of the tens of thousands of boulders along the Snake are evidence of early inhabitants. Some petroglyphs are probably from the Early Archaic (5000 to 7800 years ago) and Middle Archaic periods (1000-5000 years ago), though most are from the Late Archaic period (340 to 1000 years ago). 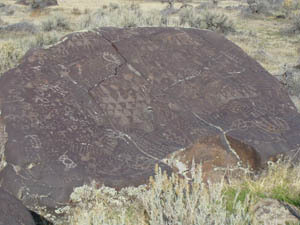 Many of the petroglyphs along the Snake resemble Shoshone Indian art found in California and Nevada. 1750 AD marks the beginning of the Equestrian period, which 'revolutionized' the Shoshone and northern Paiute way of life, by expanding hunting and trading territories, and improving hunting techniques and weapons. 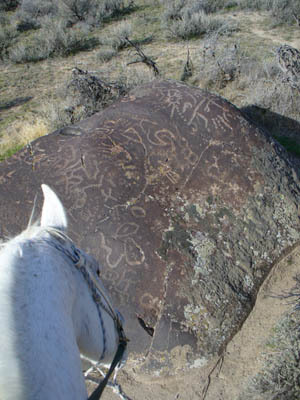 You might get lucky enough to stumble across a horse petroglyph from this period along the Snake River. Another hundred years later saw the beginning of the decline of the Native American Indian (if you have never read Bury My Heart At Wounded Knee, it's one book you should read) and the real pioneer immigration to the West and Northwest. The Oregon trail was a main route for thousands of settlers. Parts of it were scouted as early as 1823 by trappers and traders, and by 1841-1869 it was used regularly. This corner of Idaho was also home to Gold Rush fever. Searching for the legendary Blue Bucket Diggings and a Lost Mine somewhere near the Oregon Trail led to first gold strikes northwest of Boise, in Idaho City, in 1862. In 1863, just south of the Snake River in the Owyhee Mountains, the gold rush was on below War Eagle Mountain - you can see it from the top of the river canyon - where the mining ghost town of Silver City lives on. On the plateau, you may still come across some old mining relics. Or, you may ride right by an as-yet-unrecorded pioneer grave, (discovered by Tom Noll on an endurance ride in May) not far off the remains of the Oregon Trail (where you can still see what looks like old wagon tracks), at the top of the canyon road leading down to the Snake and the Swan Falls Dam. Swan Falls Dam, the first dam on the Snake River/Columbia River system, was built in 1901 to provide electricity to the mines in the Silver City area. A new dam was built in the 1990's, and the old one relegated to a historical display. 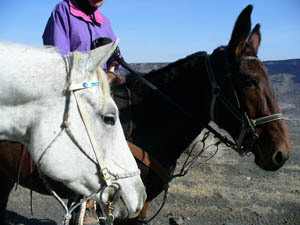 Saddle up a horse for a Saturday ride down to the Snake River in Owyhee County, and these are some of the historical ghosts you get to ride with.